Enjoy fresh perspectives with the camera that’s made to shoot on the move thanks to Balanced Optical Steady Shot with Intelligent Active Mode and Fast Intelligent AF. Go wide and long with the class-leading 26.8mm G lens and 30x optical zoom, while adding pro-style features like time-lapse capture and a Highlight Movie Maker. It’s ready to rock—or run. Create cinematic video in high definition 1920 x 1080 30p/60p up to 50Mbps in XAVC S3 and high quality 9.2MP still images. XAVC S format uses MPEG-4 AVC/H.264 for video compression and linear PCM for audio compression, while saving files in a MP4 wrapper which allows for extensive record times and easy editing. Experience stunning low-light sensitivity with improved image clarity and drastically reduced grain with Sony’s back-illuminated Exmor R CMOS sensor. On standard Optical SteadyShot camcorders, a single 'shift lens' is moved in the optical block to offset camera shake. Balanced Optical SteadyShot moves the entire optical block at once, maintaining the integrity of the optical path and reducing shake and distortion in videos and still photos. Boss has now been improved to offer 5-xis stabilization from wide angle to telephoto. Fast Intelligent AF achieves incredibly rapid and accurate contrast-detection. It minimizes lens motion, predicting the AF range, and accelerates the lens drive, thereby improving response so you can capture precise moments. You can capture high resolution still images continuously over an extensive period of time at a selected constant interval from each shot to the next, edit the entire sequence of still images in post-production, and enjoy playback of that series of images as a Full High Definition time-lapse movie. The 3.0 inch (16:9) Clear Photo Plus LCD (230K) displays sharp, bright, vivid images, letting you compose a shot more easily -- even outdoors, while enabling you to change settings to best represent the scene. Expand shooting possibilities for both movie and stills by attaching optional accessories via the Multi Interface Shoe or mic jack. Expanded accessory connectivity with MI Shoe includes powerful external flash and LED lights and stereo microphones. You can also connect with a compatible remote control via Multi Terminal. Dolby Digital 5.1 channel recording captures active sounds coming from all directions, so you can experience your home movies the way you experienced them while recording. Premium sound features such as Auto Wind Noise Reduction and Premium Closer Voice make it even easier to attain ideal sound quality in various situations. Records high quality linear PCM (XAVC S) and AAC-LC 2ch (MP4). Easily connect to an Android or iOS smartphone or tablet with Wi-Fi and the PlayMemories Mobile app to control the camcorder (Rec, photo, zoom) or instantly transfer, share movies and photos via your mobile device. 7 NFC (Near Filed Communication) makes it even easier to connect to NFC or Bluetooth compatible mobile devices with one touch. Share the memories as they are created via Ustream live streaming8. Now your circle of friends and family can share the excitement in real time by simply logging in to UStream from anywhere. You can also link your favorite social accounts with the streaming to notify your friends when you start streaming video. Add a different point of view by including other camera angles to your movies. 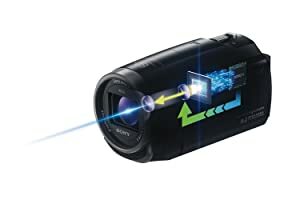 The camcorder connects up to five compatible cameras5 - like an Action Cam - via Wi-Fi and uses the camcorder’s LCD to preview what the other cameras are seeing and simultaneously start recording on all synced cameras. Use PlayMemories Home6 to easily edit a multi-view movie for a great video experience. 2015 Sony Electronics Inc. All rights reserved. Reproduction in whole or in part without written permission is prohibited. Sony is not responsible for typographical and photographic errors. Features and specifications are subject to change without notice. 1. When SteadyShot is set to 'Standard' or 'Off'. 2. Requires editing with PlayMemories Home (free software for PCs) ver. 5.1 (available in January 2016) or later version. 3. 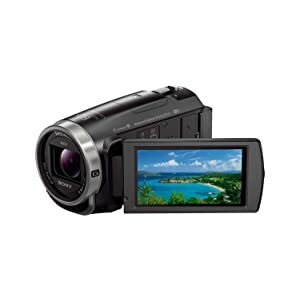 Available in AVCHD only. 4. Not available in AVCHD PS mode and XAVC S HD 60p/50p (NTSC/PAL) mode. 5. Requires a Wi-Fi router or smartphone capable of tethering. 6. Requires Micro SDXC/SDHC memory card Class 10 or higher. 7. Requires NFC-compatible mobile device. Check device’s user manual for compatibility. 8. Requires a Ustream ID, password and Wi-Fi setting need to be stored in the camcorder.